WHY CHOOSE ACREE AIR CONDITIONING? When your HVAC unit or plumbing system breaks down, life can be frustrating and the last thing you need is a difficult service company to work with. We know this, so from our call-center staff to our on-site technicians, we do our best to deliver high-quality work and a red-carpet level of service that you haven’t seen anywhere else. Every one of our technicians undergoes a full background check and drug test before being hired. We want to make sure that we keep a team that you trust, so our team is fully licensed, bonded, and insured to give you peace of mind while we’re working. There’s no way we would hire anyone that we wouldn’t trust to do work for our own homes and families. We use a live call-center for scheduling and dispatching. There are no machines asking for your information when you call in. It doesn’t matter if you’re looking for a new installation, a regular maintenance, or an urgent repair, we’ll do our best to schedule service around your time-table. Some plumbing and HVAC problems are more urgent than others, which is why we offer immediate 24/7 service. When you’re in need, we’re there to meet you with our same-day service guarantee. Our scheduling is for a specific time. We’ll give you a courtesy call before arrival so you can be prepared and don’t have to spend your day waiting for us to show up. We’ll be there when we say we will. From the moment our technicians arrive, their training takes over and they begin to work. 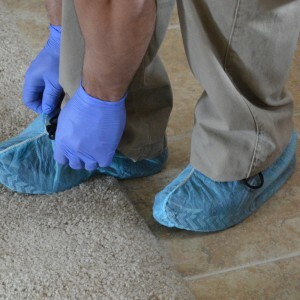 Shoes are covered and the work area is protected to make sure that we don’t make a mess of your home. When we’re finished, we’ll tidy up so that you’re not left with more work to do after we’ve gone. As a service to you, we have our Straight Forward Pricing Guide, so that you’ll know the cost of any repairs or work we’ll be doing before we’ve started. From the moment you call to the point where we’ve finished working, your satisfaction is 100% guaranteed for the work we do. This guarantee and the training our service experts undergo on a regular basis are how we’ve been serving the greater Tampa Bay community with excellent customer care since 1967. Our coverage area is always expanding, so if you don’t see your location, contact us today to see if we’ve already expanded into your city. 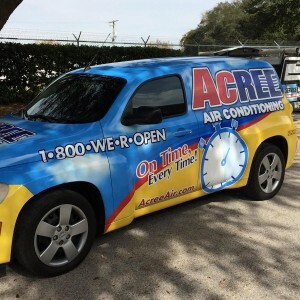 Call today to schedule your service with Acree Air Conditioning at 1-800-937-6736!